Blog to End the Occupation: Occupy CU and Demand Divestment from Israeli Apartheid! Occupy CU and Demand Divestment from Israeli Apartheid! 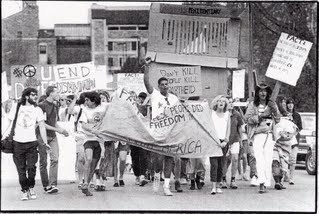 In the 1980's, University of Colorado (CU) students "occupied" CU until the university divested from apartheid South Africa. Now US Campaign member group CU-Divest! is prepared to occupy CU again until it divests from Israeli apartheid. Read about their plans and how you can support them below! *Occupy CU Nov 9* Tell the Regents at the University of Colorado not to support Israel’s illegal occupation and apartheid of Palestine. Occupy demonstrations are springing up from Wall Street to Pearl Street. Some of these demonstrations remind me of protests in the ‘80s when students and activists “occupied” CU. The cause then was divestment from South African apartheid and involved rallies, sit-ins, and teach-ins. The students even built shanty towns representing the apartheid Bantustans where white South Africans were intent on segregating Blacks. The civil disobedience on CU’s campus in April 1988 pressured the Regents to change the University’s investment policy. Four months later, in August 1988, the Board of Regents voted to divest. Now, 23 years later, the Regents are confronted with a similar movement and demand: divestfrom Israeli apartheid. A local grassroots campaign called CU-Divest! representing students, faculty, alumni, and concerned citizens has collected more than 2200 signatures on a petition demanding the University divest from companies like Caterpillar, Motorola, Northrop Grumman and Veolia – companies that support and profit from Israel’s apartheid of Palestine. What’s Israeli apartheid? It’s the institutionalized racism that oppresses Palestinians. It’s the military occupation that enforces Jewish-only settlements, Jewish-only roads, Jewish-only buses, and walls up Palestinian neighborhoods behind a 25 ft high separation wall.